For the first 15 minutes of Thursday’s NCAA women’s volleyball national semifinal match, fourth-seeded BYU looked like it belonged on the same court as No. 1 seed Stanford. The taller, deeper Cardinal took over after trailing 10-6 in the first set and didn’t look back. Stanford dominated from there and swept the Cougars 3-0 at Target Center in Minneapolis, Minn., to advance to Saturday’s championship match. Stanford will face defending champion Nebraska. The scores were 25-15, 25-15 and 25-18 as BYU (31-2) lost for only the second time all season. Stanford (32-1), which was beaten 3-2 by BYU on Aug. 31 for its only loss of the year, put together a 16-3 run in the first set and completely shut down BYU’s attack. The Cardinal out-blocked BYU 17-4 and got 11 kills and nine blocks from Audriana Fitzmorris; Tami Alade had 14 of those blocks, one shy of a career-high. Morgan Hentz added six digs. Interviewed by ESPN after the Cougars were outscored 50-30 in the first two sets, BYU coach Heather Olmstead said the Cougars were having a difficult time handling Stanford’s powerful serves. The Cougars never did, although they started to play better in the third set. BYU led that set 12-9 after Lyndie Haddock-Eppich’s kill. But Stanford went on an 11-3 run and BYU was finished. “It took us a while to find ourselves, but once we got comfortable, our offense started clicking,” said Stanford coach Kevin Hambly, who played for BYU from 1992 to 1995. He is now 62-5 in two seasons at Stanford. The Cougars played the last month without star outside hitter McKenna Miller, who sustained an ACL injury in early November. 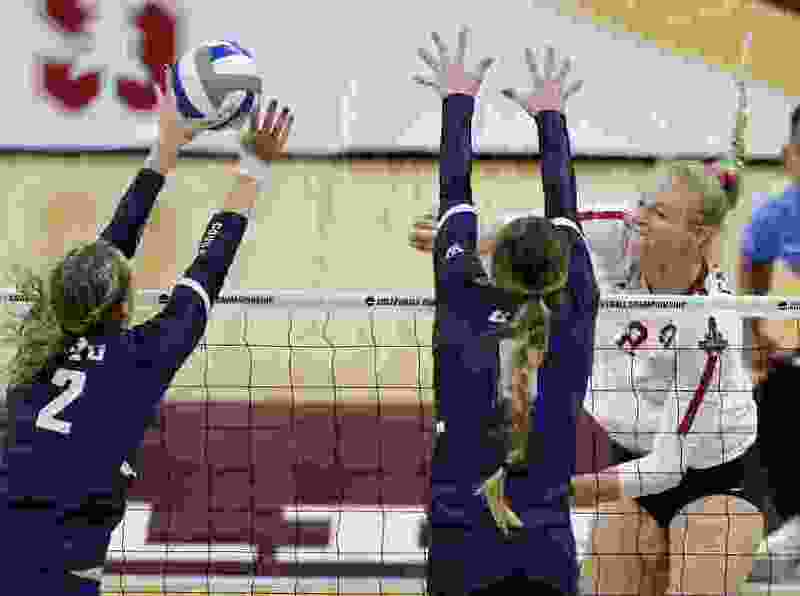 They were able to sweep Texas in the Provo Regional finals last Saturday without the honorable mention All-American, but Stanford was just too big at the net. BYU entered as the No. 1 hitting offense in the country, but hit minus- .132 in the first set, minus-.081 in the second set and .125 in the third set. Thursday started more favorably for BYU as Olmstead was named the National Coach of the Year by the American Volleyball Coaches Association (AVCA). She was trying to become the first female coach to win a national championship in volleyball; the other three teams in the Final Four are coached by men. Olmstead now has a 118-13 career record (.900) and has the highest winning percentage of any women’s volleyball coach in NCAA Division I history (minimum one season) and in NCAA history in any division (minimum three seasons). Her brother, Shawn Olmstead, won the award in 2014 when he led the Cougars to the national championship match.